LEE GRAHAM is just an ordinary bloke, he's no-one special (his words, not ours!) - so what is he doing here, gracing the hallowed pages of the Get Ready To Roll! website? He's doing quite a lot as it happens - let's find out! Hey Lee, your "JUST PUSH PLAY" fundraising event is in its fourth year now, and has gone from strength to strength. Tell us how and why you started it, and how it's grown each year. Hi, yes, the event started in 2015, five years after my Dad passed away from a short but intense battle with cancer. It was 13 days from his diagnosis to him passing away. I had been so busy grieving and processing what had happened that it wasn't until the 5-year mark that I realised I had done nothing to support the hospice that cared for my Dad during his final days. Some friends and I were kicking fundraising ideas around the pub one night, and someone jokingly (and drunkenly!) said "Lee, you should organise Live Aid" and I thought "A gig is a bloody good idea". It made sense - my Dad and I both loved the same music and we went to a lot of gigs together. He wasn't just my Dad, he truly was my best friend, and music was a huge part of our friendship. Also myself and my friends played in various local bands, so it made perfect sense. We booked the Constitutional Club in Bury St Edmunds (my home town), and I thought we would get maybe 30 or 40 people come along and we'd raise a couple of hundred quid for St Nicholas Hospice Care. In fact we had over 150 people through the door and raised just over £1,300 for the hospice, which was absolutely fantastic! The event was intended to be a one-off to mark the fifth anniversary, but given the success of the initial event, when 2016 rolled round I had people asking if I was hosting another show, and others asking if their bands could play. So whilst the enthusiasm was still there I decided to go for it. Again this was hosted in the Constitutional Club. 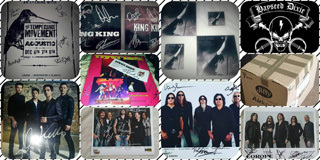 We also added a charity auction that year, and were lucky enough to have items from bands such as Black Stone Cherry, Saxon, Tax The Heat, Karnivool, and The Dead Daisies. This brought a lot more attention to the show and the second year we raised over £1,500 for St Nicholas Hospice. With two very successful years under my belt I decided to make this an annual event for as long as the interest was there, and 2017 was no disappointment. Last year, along with the gig itself we held the "Just Push Play" charity auction. We had some incredible items for 2017 donated by acts including UFO, Bernie Marsden, Europe, Gary Numan, Stereophonics, King King, Rival Sons, The Temperance Movement, Tigertailz and more. Last year we completely smashed the previous year's total, raising over £2,500 which was absolutely fantastic. So, this year's event is JUST PUSH PLAY 4 : TRAIN KEPT A'ROLLIN'. What, when, where, who, and how much? This year, after the success of the first three shows, I decided to see whether we could develop the gig further and kick it up a gear. So thanks to a successful crowdfunder campaign and sponsorship from several local businesses (British Sugar, Churchill Catering, Cobham PLC, Epic Nerf Party, Portable Space Ltd and Planet Laser - sincere and grateful thanks to all of these companies!) we managed to raise the funds to host JUST PUSH PLAY 4 : TRAIN KEPT A'ROLLIN' at THE APEX, which is an 800 capacity venue in Bury St Edmunds where bands such as King King, Joanne Shaw Taylor and Roy Wood have previously played. We are hosting the show on Sunday the 5th August which is the anniversary of my Dad's passing - we thought it would be a fitting tribute to host it on this date. As well as a bunch of brilliant local bands such as Druids, Amethysts, In My Disguise, The Fretz, Circadian and Mouse-Drawn Cart we have booked The Bad Flowers to headline so we have an absolutely amazing line up this year. With this and the step up in venue it looks to be the biggest and best show yet! Tickets are priced at £8 and are available at www.theapex.co.uk if anyone reading this is interested in coming down and supporting this fantastic cause! 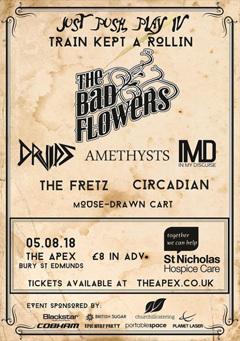 It's quite an achievement to take a tragic family event and turn it into a positive experience - not just for your own family, but also for the St. Nicholas hospice, the patients, their families, the hospice staff, and also for everyone who attends the Just Push Play gigs and for everyone who bids at the auctions. What's your secret? How do you motivate people into taking part? There's no secret really. I'm no one special, but I am very passionate about the hospice and the amazing work they do. Their nurses may have only cared for my Dad for 13 days but the dignity, care and respect they gave him during this horrendous period was second to none and for that I will forever be in their debt. My Dad was simply my hero. I want the event to be a success, to make him proud - and that's all the motivation I need. Plus, music is a huge passion of mine so I am more than happy to find new and exciting bands, local or otherwise. I've found people genuinely want to be involved when I speak to them. Sadly, cancer has affected most people's lives in one way or another. The hospice is a big and vital part of our community and one that everyone who has been touched by it wholeheartedly supports. 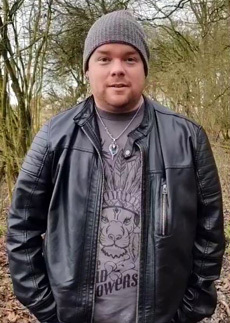 The Just Push Play charity event might be my idea and yes it may look like I run the show, but I simply couldn't do any of this without the support of the local community - they have been absolutely amazing and I can't thank them all enough. Family, friends and even people I don't know have always been incredibly supportive and gone out of their way to dig in and help out - especially with this step-up to The Apex it has reached a wider circle and everyone has been incredible. What can people bid for in this year's auction? • 2 x Stonedeaf Festival Tickets (Arena & Camping) - a chance to win these tickets for just a £5 bet - check it out! • 2 x 6 months membership of The Defence Lab (the Martial Arts and Self-Defence training centre) in Bury St Edmunds - buy a £5 square to be in with a chance! • A pencil portrait of Lemmy Kilmister of Motorhead by Little Jo Art - anyone can bid on this for just a fiver, find out how, here! • Thunder - All You Can Eat Blu-ray, The E.P Sessions 2007 - 2008 CD, 20 Years & Out Live CD, Bang CD, The Tombstone Acoustic Sessions CD and Live At Donington CD! What have been the benefits so far to the hospice? And what are you aiming for with this year's event? 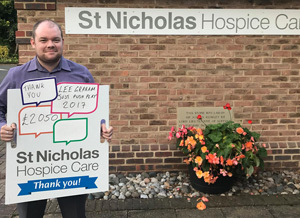 So far we have raised over £5,000 for St Nicholas Hospice Care over the three events, which is more than I could ever hoped to have raised on my own. The hospice needs around £11,000 a day just to keep going, and they rely purely on donations and fundraising in order to continue the amazing end of life care that they deliver. I would like to have as many people as possible at the show and lots of bids on the auctions. Every single penny raised from this show goes straight to the hospice. I do it out of love for what they do (and for the love of rock n roll too of course!) but naturally with this step-up in venue it would be great if this year we could smash the money we raised last year. Going by the titles of these events, I'd take a wild guess that you're most likely a fan of Aerosmith... but what other bands push your 'play' button - and for each one, why so? I certainly am a massive fan of Aerosmith, as was my Dad. The first gig we ever went to together was Aerosmith. He took me to see them at Wembley Stadium when I was 11 years old at the "Toxic Twin Towers Ball" as part of their Nine Lives tour, and from then on I was hooked and we went to see them every time they came to the UK after that. So that's why I called the event what I did, in a nod to our favourite band together. • Rival Sons - They are one of my favourite bands, I have seen them eight times now and always come away buzzing for days. The band is tight as hell and seems to get stronger and stronger with each album. They take you up into the stratosphere Llive and I challenge anyone to go and see them and not have a good time. Even at Ramblin' Man Fair in the downpouring rain I was smiling whilst they played. • Gary Numan - As well as rock my Dad also brought me up on this guy. Gary Numan has always been one of my favourite artists and I think it would be very easy for someone like him to stick to doing the "nostalgia tours" but he is still writing simply incredible music and I think his latest album "Savage" is the best of his career. I have seen him Live twelve times and he always puts on an amazing show. They don't call him "the godfather of industrial" for nothing. • Steven Wilson - Having just seen him play Live for the third time at the Royal Albert Hall in March I can't *not* mention this guy. His performance is always simply captivating. I have not been to a gig where someone has taken me through such a range of emotions as this guy. I love the fact that each record is different and he goes wherever he wants to go. • The Bad Flowers - I have to mention these guys - not only are they headlining this year's show, they are also a new favourite of mine. I bought their "Starting Gun" debut album in January and it has been more or less on permanent rotation since. Good hard rock n roll with big riffs, thundering basslines, pounding drums and big hooks, just the way I like it. Bands like these guys prove that rock n roll aint dead! Reaching further afield, if people can't get to the gig, or aren't successful at winning any of the auction prizes but would still like to donate... how can they do that? I will be setting up a a JustGiving page closer to the show. In the meantime though, if anyone wishes to donate they can contact me via the Facebook page or use the Paypal button here. You can also use this button to buy a square in any of the Buy A Square auctions (for the Lemmy portrait, the Defence Lab membership, and the Stonedeaf festival tickets). Just include a message with your Paypal donation. Thank you! Thanks Lee, it does sound like 2018's event is well on the way to being a great success. Anything else you'd like to say about the cause? Cancer is a cruel, evil, vile, selfish monster which has taken the life of far too many people's loved ones. I hope that one day they find a cure but in the meantime I will continue to support St Nicholas Hospice and the amazing work they do there. I can't bring my Dad back, sadly, but I can fund-raise to support a hospice that gives such amazing care when people need it most. Thank you to everyone who's involved with the hospice, and also to everyone who's been involved with all the Just Push Play events, past present and future! 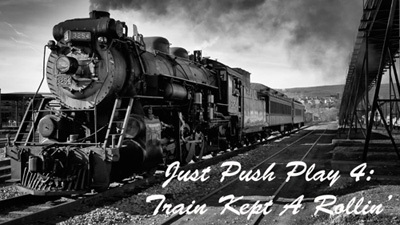 Please click on the link above to go to Lee's Just Push Play 4 : Train Kept a'Rollin Facebook page.